No surprise, really. When I drew a goddess card this morning, I selected Kali. As always when I see her beautiful, powerful, wise visage, my heart sank and leapt all at once. Heart heavy from loss and excited at possibility. 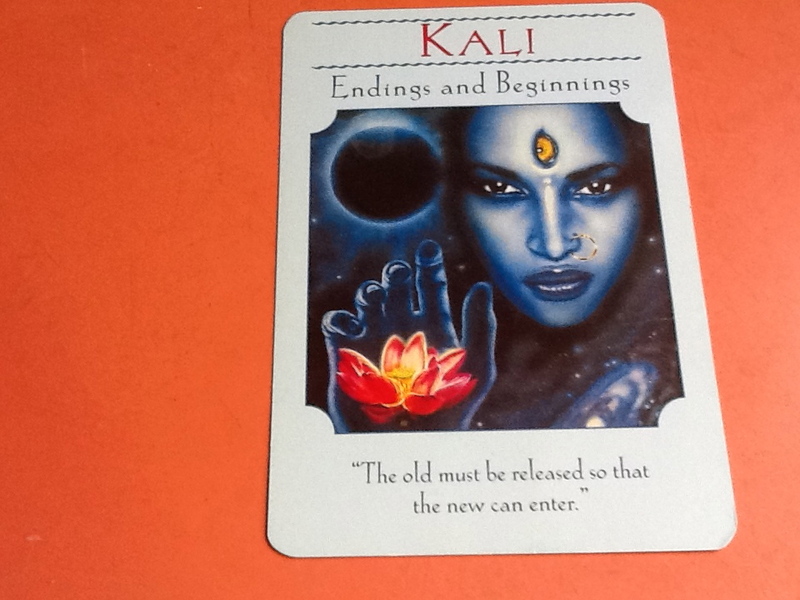 As Kali advises, “The old must be released so that the new can enter.” (Goddess Guidance Oracle Cards, Doreen Virtue). I know this. And yet I don’t know this. Or want to accept it. This entry was posted in Creativity, Inspiration, possibility and expansiveness and tagged beginnings, endings, expansiveness, goddess, goddess cards, Inspiration, Joy, Kali, loss, possibility, process, transition. Bookmark the permalink. So true. No room for the future, for more or different, when we are held down by too much of the past. Thanks for sharing your wisdom, Emilie. Happy Spring! Yes….the cycle of life….why would it ever end? Indeed, Eileen. Thank you. Speaking of cycles, wishing you a wonderful spring, season of birth and rebirth….